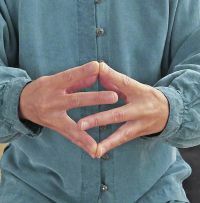 There are 1000’s of different qigong exercises, working on a myriad of approaches to promoting good health and allieviating ailments of various kinds. Some are static; sitting, standing or lying and many are dynamic vigorous routines. Here Franziska Rüscher of Austria provides us with a simple sequence of finger exercises which help to regulate the flow or qi energy through the body. Our fingers are connected to our brain. 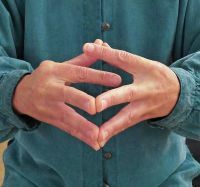 So these finger-exercises promote flexibility in our fingers, connect the left and right hemisphere of our brain, produce flexibility in thinking and harmonise the energy flow to the internal organs. The tips of the fingers should stay in a good contact. Only one of the finger-pairs are moving. Try to circle with the base joints of each finger. 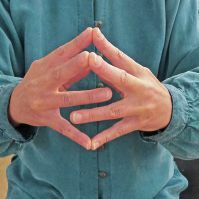 Circle around nine times in one direction, and after you have done this with all fingers circle nine times in the other direction. 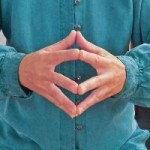 1) Bring the tips of the finger together, thumb to thumb, forefinger to forefinger and so on. 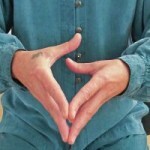 Start to rotate each finger in clockwise direction. 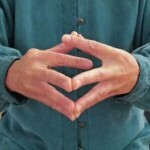 After change direction and circle again with each finger pair nine times. 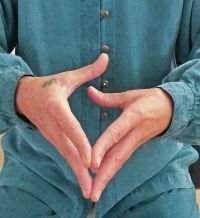 (Interessensvertretung der Qigong und Taiji Quan Lehrer Österreichs).